60 minute massage only $65! 90 minute massage only $85! Call 843.640.2444 to book your appointment today! It’s time for you. Pick your time frame and your focus, and we’ll go from there. 75 minutes or more is highly recommended for a full body massage. Gift Certificates are available. Buy 5 Massages, get *15% OFF! Buy 10, get 2 Massages FREE!! Enhance your massage experience with our warm cocoa butter massage! Heated cocoa butter is blended into your massage oil, leaving your skin baby soft, while the soothing cocoa aroma enhances your relaxation experience. Cocoa butter also is a natural mood elevator, since the cocoa stimulates the release ofendorphins(like a chocolate bar without the calories). This treatment also contains shea butter, a natural anti-inflammatory.Soothing hot towels gently wipe the cocoa butter away while adding further warmth and relaxation. Taking care of mom-to-be, massage helps relieve the discomforts of pregnancy and deepens your connection with your body, so important during labor. Massage during pregnancy is safe and has been shown to shorten labor time and hospital stays and to reduce complications and postpartum depression. Must be past eight weeks. Lymphatic drainage massage is a form of medical massage to detoxify the body and stimulate immune function. It alleviates pain, stress, depression, fibromyalgia, skin conditions, and arthritis, and is excellent for pre- and post-surgical care. Most important, it boosts energy. Our certified therapist, Anna Nielson, LMT will help you achieve your treatment goals. Click here for more info and pricing. Edema massage reduces swelling and pain in the entire body or in a focused area. It is a very light compression massage. At least 75 minutes is recommended for a full body massage, though a 60 minute targeted Edema massage is available. The 120 minute length is for those who would like the Edema massage for one area of the body and regular Swedish massage for other areas. Our certified therapist, Anna Nielson, LMT can help you decide the appropriate length of time for your massage. It is safe during a healthy pregnancy. Pamper the mommy-to-be with a full body massage and sugar scrub. Her massage will include the essential oils of lavender to relax her, cypress to reduce swelling, and citrus to combat fatigue. A tangerine and lavender sugar scrub will leave her skin as baby soft as the day she was born. Prenatal massage is perfectly safe during a healthy pregnancy. It can reduce stress, soothe aches and pains, and give her a well deserved indulgence. Since massage is so beneficial during pregnancy, we're offering this special pricing just for her. She can resume massage at six weeks postpartum, or sooner with her doctor's approval (and this package may be used postpartum if she was not able to fit in all sessions before delivery). Pregnancy can be very stressful for mothers-to-be. It causes tremendous physical, hormonal, and emotional changes, aches and pains, swelling, and other discomforts. Massage alleviates them and has also been scientifically shown to reduce risk factors for premature delivery (a huge health risk for newborns), reduce labor time, pain, and hospital stay. Nurture the pregnant woman, and you nurture her unborn child. Aimed at maintaining optimal body condition for athletic training and events, sports massage helps both professional athletes and weekend warriors avoid injuries, recover more quickly from events, and maintain a body that is better in tune with its abilities. Pre-event massage focuses on warming up and stretching muscles so athletes can achieve maximal function earlier. Post-event enhances blood flow and recovery. During sports training, focused work on problem spots can improve and maintain flexibility in muscle, tendons, and ligaments. Package pricing is available for sports massage. 60 minute sessions are available, but longer times are recommended for most sports massage needs. 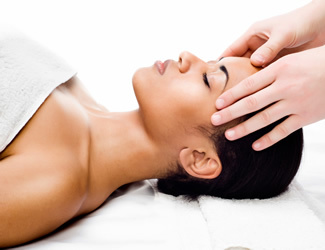 Massage relieves the tension that causes most headaches. Enjoy a soothing massage aimed at releasing the tension in your face, neck, upper shoulders, and back. Includes essential oils of peppermint and/or lavender, known for relieving headaches. This form of massage therapy works to release your sore spots with gentle, sustained pressure and stretching. It feels like a good hurt and is great for the relief of back pain. Reiki means "universal life force energy" and is a holistic therapy for emotional, physical, mental, and spiritual healing. Reiki balances your body's energy so that it can better heal itself. For more details, visit Reiki on this site. Sessions include a brief discussion as well. This service combines the benefits of Reiki with massage for those who want to directly experience Reiki but also want some "hands-on" time. This is a deeply relaxing, balancing experience. The ultimate in relaxation bliss! All the benefits of a Reiki-ssage, only with two therapists working on you at once - one massage therapist and one Reiki practitioner. This gives you the experience of a full body massage, plus a full Reiki treatment, all in one. Coined "The Coma" by original owner Rachel Hazelwood after she experienced this blissful offering. Need lots of massage work done, but don't have the time? Double the pleasure with our Massage Duo; two massage therapists working on you at once! This decadent service allows you to have the benefits of a two hour or two and a half hour massage, without the time commitment - not to mention the extra relaxation benefits of having four hands working your tired body into soft, happy putty.